Begin by holding up a picture of the Sacrament. You can use any of the images found at this link or photos in the Gospel Art Book. Ask: How does this picture relate to Jesus Christ? Read aloud: One of the greatest ways we can worship our Savior is to partake of the sacrament in a sacred and meaningful manner. Christ instituted the sacrament during his mortal ministry as a way for his disciples to remember him and renew their covenants. The same is true for us today. Have someone read the sacrament prayers found in D&C 20:77-79. Ask: What are some of the things we promise to do in these scriptures? What are some of the blessings we are promised in return? Read aloud: Worthily partaking of the sacrament should be the highlight and focus of our Sabbath day. However, there are many things that can make it hard to truly partake of the sacrament as Christ would like us to. We can become distracted. We can get used to it. We can forget why it is important. We can not think about the sacrament at all during the week and come unprepared. Ask: Why can it be hard to focus on the sacrament? What can we do to make the sacrament a more sacred time? Read aloud: To partake of the sacrament prepared by the priesthood is a great blessing and privilege. Here are a few questions we can ask ourselves to know how we feel and prepare for the sacrament. Do I think about the words of the sacrament hymn? Do I listen to the sacrament prayers? Do I remember that Jesus suffered and died for me? Do I feel sorry for mistake I have made? Do I promise to do better? In what ways can I improve? Finish the lesson by asking people to share how the sacrament has blessed their life. Share any personal experiences you may have. Bear your testimony. Butter a 9×13″ dish and set aside. Combine Sugar, cinnamon and nutmeg in a shallow dish and mix well. Set aside. Chop pie filling into small size pieces. Microwave tortillas for 20 seconds to soften. Spread tortilla with thin layer of caramel sauce in the middle. 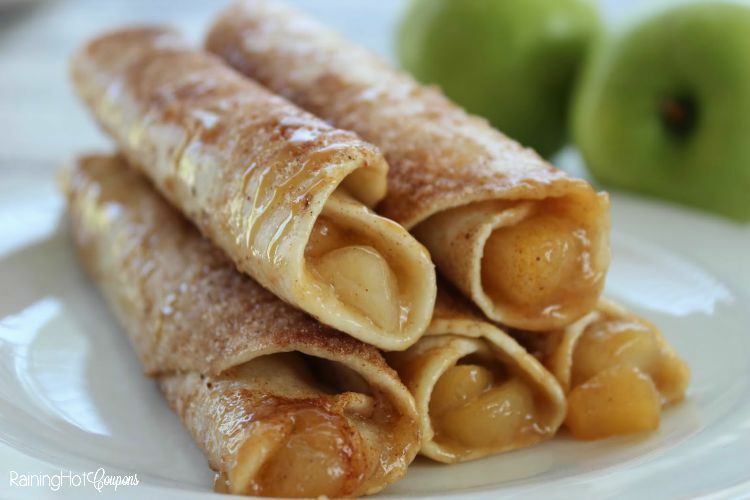 Cover caramel with diced apple filling. Roll tortilla and place in prepared dish. Brush with butter and sprinkle with sugar mixture. Bake for 15 minutes of until golden and bubbling on ends. For this game, you’ll need empty water bottles, tennis balls (you can also use fruit or another round ball), and nylons. Place the water bottles standing up on the floor. Place one tennis ball in each nylon and place the nylons on your head. The goal of the game is to try and knock over the water bottles. Whoever knocks over the most water bottles in one minute wins.